"Flow chart" redirects here. For the poem, see Flow Chart. For the music group, see Flowchart (band). A simple flowchart representing a process for dealing with a non-functioning lamp. A flowchart is a type of diagram that represents an algorithm, workflow or process, showing the steps as boxes of various kinds, and their order by connecting them with arrows. This diagrammatic representation illustrates a solution model to a given problem. Flowcharts are used in analyzing, designing, documenting or managing a process or program in various fields. a decision, usually denoted as a diamond. A flowchart is described as "cross-functional" when the page is divided into different swimlanes describing the control of different organizational units. A symbol appearing in a particular "lane" is within the control of that organizational unit. This technique allows the author to locate the responsibility for performing an action or making a decision correctly, showing the responsibility of each organizational unit for different parts of a single process. Flowcharts depict certain aspects of processes and they are usually complemented by other types of diagram. For instance, Kaoru Ishikawa defined the flowchart as one of the seven basic tools of quality control, next to the histogram, Pareto chart, check sheet, control chart, cause-and-effect diagram, and the scatter diagram. Similarly, in UML, a standard concept-modeling notation used in software development, the activity diagram, which is a type of flowchart, is just one of many different diagram types. Nassi-Shneiderman diagrams and Drakon-charts are an alternative notation for process flow. Common alternative names include: flowchart, process flowchart, functional flowchart, process map, process chart, functional process chart, business process model, process model, process flow diagram, work flow diagram, business flow diagram. The terms "flowchart" and "flow chart" are used interchangeably. The underlying graph structure of a flow chart is a flow graph, which abstracts away node types, their contents and other ancillary information. Template for drawing flowcharts (late 1970s) showing the different symbols. The first structured method for document process flow, the "flow process chart", was introduced by Frank Gilbreth to members of the American Society of Mechanical Engineers (ASME) in 1921 in the presentation “Process Charts—First Steps in Finding the One Best Way”. Gilbreth's tools quickly found their way into industrial engineering curricula. In the early 1930s, an industrial engineer, Allan H. Mogensen began training business people in the use of some of the tools of industrial engineering at his Work Simplification Conferences in Lake Placid, New York. A 1944 graduate of Mogensen's class, Art Spinanger, took the tools back to Procter and Gamble where he developed their Deliberate Methods Change Program. Another 1944 graduate, Ben S. Graham, Director of Formcraft Engineering at Standard Register Industrial, adapted the flow process chart to information processing with his development of the multi-flow process chart to display multiple documents and their relationships. In 1947, ASME adopted a symbol set derived from Gilbreth's original work as the "ASME Standard: Operation and Flow Process Charts." Douglas Hartree in 1949 explained that Herman Goldstine and John von Neumann had developed a flowchart (originally, diagram) to plan computer programs. His contemporary account is endorsed by IBM engineers and by Goldstine's personal recollections. The original programming flowcharts of Goldstine and von Neumann can be seen in their unpublished report, "Planning and coding of problems for an electronic computing instrument, Part II, Volume 1" (1947), which is reproduced in von Neumann's collected works. Flowcharts became a popular means for describing computer algorithms. The popularity of flowcharts decreased in the 1970s when interactive computer terminals and third-generation programming languages became common tools for computer programming. Algorithms can be expressed much more concisely as source code in such languages. Often pseudo-code is used, which uses the common idioms of such languages without strictly adhering to the details of a particular one. Nowadays flowcharts are still used for describing computer algorithms. Modern techniques such as UML activity diagrams and Drakon-charts can be considered to be extensions of the flowchart. Notice that every type of flowchart focuses on some kind of control, rather than on the particular flow itself. However, there are several of these classifications. For example, Andrew Veronis (1978) named three basic types of flowcharts: the system flowchart, the general flowchart, and the detailed flowchart. That same year Marilyn Bohl (1978) stated "in practice, two kinds of flowcharts are used in solution planning: system flowcharts and program flowcharts...". More recently Mark A. Fryman (2001) stated that there are more differences: "Decision flowcharts, logic flowcharts, systems flowcharts, product flowcharts, and process flowcharts are just a few of the different types of flowcharts that are used in business and government". In addition, many diagram techniques exist that are similar to flowcharts but carry a different name, such as UML activity diagrams. The following are some of the commonly used shapes used in flowcharts. Generally, flowcharts flow from top to bottom and left to right. Flow Line An arrow coming from one symbol and ending at another symbol represents that control passes to the symbol the arrow points to. The line for the arrow can be solid or dashed. The meaning of the arrow with dashed line may differ from one flowchart to another and can be defined in the legend. On-Page Connector Generally represented with a circle, showing where multiple control flows converge in a single exit flow. It will have more than one arrow coming into it, but only one going out. In simple cases, one may simply have an arrow point to another arrow instead. These are useful to represent an iterative process (what in Computer Science is called a loop). A loop may, for example, consist of a connector where control first enters, processing steps, a conditional with one arrow exiting the loop, and one going back to the connector. For additional clarity, wherever two lines accidentally cross in the drawing, one of them may be drawn with a small semicircle over the other, showing that no connection is intended. Annotation Annotations represent comments or remarks about the flowchart. Like comments found in high-level programming languages, they have no effect on the interpretation or behavior of the flowchart. Sometimes, the shapes consists of a box with dashed (or dotted) lines. Terminal Represented as circles, ovals, stadiums or rounded (fillet) rectangles. They usually contain the word "Start" or "End", or another phrase signaling the start or end of a process, such as "submit inquiry" or "receive product". Decision Represented as a diamond (rhombus) showing where a decision is necessary, commonly a Yes/No question or True/False test. The conditional symbol is peculiar in that it has two arrows coming out of it, usually from the bottom point and right point, one corresponding to Yes or True, and one corresponding to No or False. (The arrows should always be labeled.) More than two arrows can be used, but this is normally a clear indicator that a complex decision is being taken, in which case it may need to be broken-down further or replaced with the "predefined process" symbol. Decision can also help in the filtering of data. Input/Output Represented as a parallelogram. Involves receiving data and displaying processed data. Can only move from input to output and not vice versa. Examples: Get X from the user; display X.
Predefined Process Represented as rectangles with double-struck vertical edges; these are used to show complex processing steps which may be detailed in a separate flowchart. Example: PROCESS-FILES. One subroutine may have multiple distinct entry points or exit flows (see coroutine). If so, these are shown as labeled 'wells' in the rectangle, and control arrows connect to these 'wells'. Preparation Represented as a hexagon. May also be called initialization. Shows operations which have no effect other than preparing a value for a subsequent conditional or decision step. Alternatively, this shape is used to replace the Decision Shape in the case of conditional looping. Off-Page Connector Represented as a home plate-shaped pentagon. Similar to the on-page connector except allows for placing a connector that connects to another page. Represented by an identifying label inside a circle. Labeled connectors are used in complex or multi-sheet diagrams to substitute for arrows. For each label, the "outflow" connector must always be unique, but there may be any number of "inflow" connectors. In this case, a junction in control flow is implied. Represented by a double transverse line with any number of entry and exit arrows. These symbols are used whenever two or more control flows must operate simultaneously. The exit flows are activated concurrently, when all of the entry flows have reached the concurrency symbol. A concurrency symbol with a single entry flow is a fork; one with a single exit flow is a join. 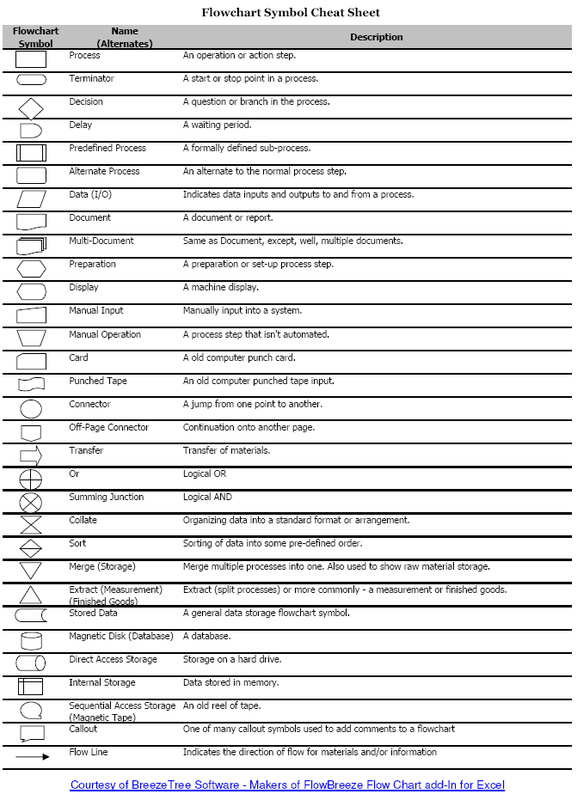 A number of symbols have been standardized for data flow diagrams to represent data flow, rather than control flow. These symbols may also be used in control flowcharts (e.g. to substitute for the parallelogram symbol). A Manual operation represented by a trapezoid with the longest parallel side at the top, to represent an operation or adjustment to process that can only be made manually. A Data File represented by a cylinder. Any drawing program can be used to create flowchart diagrams, but these will have no underlying data model to share data with databases or other programs such as project management systems or spreadsheet. Some tools offer special support for flowchart drawing. Many software packages exist that can create flowcharts automatically, either directly from a programming language source code, or from a flowchart description language. On-line web-based versions of such programs are available. There are several applications that use flowcharts to represent and execute programs. Generally these are used as teaching tools for beginner students. ↑ SEVOCAB: Software Systems Engineering Vocabulary. Term: Flow chart. Retrieved 31 July 2008. ↑ Frank Bunker Gilbreth, Lillian Moller Gilbreth (1921) Process Charts. American Society of Mechanical Engineers. "Von Neumann and Goldstine (40) have proposed a method of indicating the structure of the sequence of operating instructions by means of a "flow diagram" representing the control sequence. This is in the form of a block diagram, in which the blocks represent operations or groups of operations, and are joined by directed lines representing the sequence of these operations..."
↑ Bohl, Rynn: "Tools for Structured and Object-Oriented Design", Prentice Hall, 2007. ↑ Marilyn Bohl (1978) A Guide for Programmers. p. 65. ↑ Mark A. Fryman (2001) Quality and Process Improvement. p. 169. Schultheiss, Louis A., and Edward M. Heiliger. "Techniques of flow-charting." (1963); with introduction by Edward Heiliger. Wikimedia Commons has media related to Flow chart. This page was last modified on 12 January 2016, at 12:41.